During the last week of January, the news was awash with stories covering the current administration’s ostensibly unprecedented progress with Special Envoy Khalilzad’s recent talks with the Taliban and their Pakistani sponsors in Qatar. In a statement that the U.S. Embassy Kabul released on the last Monday in January, Khalilzad stated that the peace talks had made progress on important issues and that the negotiators had agreed on a framework for further talks in February. In the eighteenth year of a long and stalemated war, there are reasons to be sanguine about these developments, to some degree, simply because this seems to have been the most talk about peace among the belligerents yet in this long hard war. And Mr. Khalilzad is indeed one of the best people to be the U.S. envoy leading the talks given his Afghan origins and years of experience as ambassador in Afghanistan and Iraq. However, there are also reasons for much caution and some alarm about the current progress and the potential for peace in Afghanistan since the deliberations and decisions about many previously intractable issues still require prudence and patience. These details may potentially augur the gravest consequences for Afghanistan, its neighbors, and the U.S. Several things of great importance have yet to be worked out. There is still much uncertainty in what outcomes these talks will result in, and looming yet elusive peace also brings up questions and concerns about the Taliban’s and their sponsor’s true intentions. According to the U.S. position, it is imperative that the “everything” to be agreed includes direct negotiations between the current government of Afghanistan and the Taliban. A comprehensive ceasefire is also a U.S. requirement for bringing talks forward. On the other hand, until now, the Taliban have intransigently refused to talk with the legitimate Afghan government and are also apparently demanding a U.S. withdrawal before they commit to a comprehensive ceasefire, although they have stipulated that their intentions are not to monopolize or take over the Afghan government. What is also significant, but suspect, is the Taliban’s claim that they will not allow Afghanistan to again become a sanctuary, or a geographic space hospitable to al-Qaeda or Islamist terrorists of similar ilk. The timing and conditions of these seemingly irreconcilable demands will be tough to work through. The devil will be in the details and those details relate to the hard realities and facts of the long war in Afghanistan. This article postulates that the U.S. and its partners should retain their troops and advisors in Afghanistan as a means of ensuring the peace and enforcing the Taliban and Pakistan’s compliance with the terms. It explores the hard realities of Afghanistan, explains the American propensity for tactics over strategy, and examines the main reasons for the impasse in the war. It concludes by recapitulating recent potential changes in policy and by emphasizing the imperative to enforce and verify the terms of any agreement by sustaining the current operational approach and force levels. Afghanistan itself defies prediction and eludes expectations. When the Soviets withdrew in February 1989, many predicted that the Soviet-sponsored regime would collapse quickly, yet it survived for over three more years. After the U.S.-led Coalition routed the Taliban in 2001 with a modest number of special operations and conventional forces working with indigenous Afghan and using airpower, the U.S. expected an end to the war. Yet, the Taliban revived, and the war continues. Now, after the longest peace talks in a long war, some are predicting an end to the war that leads to peace. There is much to be done, and much that can happen before peace breaks out. 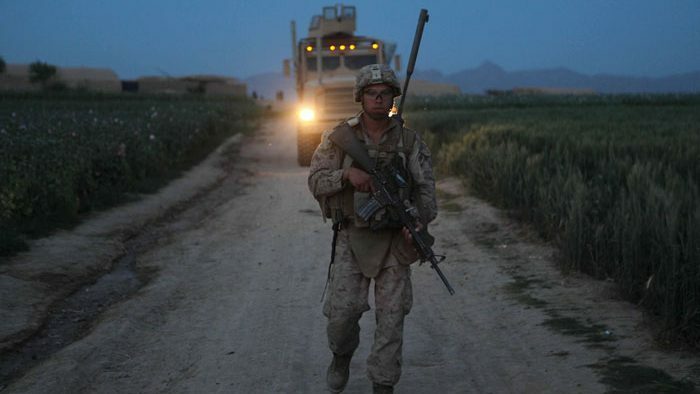 A number of fables also blur the facts about Afghanistan, as the Afghan war is not necessarily America’s longest war nor is Afghanistan the graveyard of empires, although Afghanistan has indeed proven easier to invade than to pacify. Contrary to the myth of being an ungovernable place, Afghanistan has been governable when governance has been compatible with its culture, as for almost 50 years before the 1978 April Revolution, the country saw more peace than the U.S. and Europe during the same period. Yet, war itself defies certainty and prediction because it is a complex, social, and violent interaction that sees rationality, non-rationality, and irrationality escalate and reciprocate. To be sure, for any war, there are so many variables interacting at so many levels that the outcome is impossible to predict with certainty. Add to this the petulance and impetuosity currently manifested in the American polity, and it should be clear that the details and the devil loom in the future talks. One epic problem that helps explain the long hard war in Afghanistan is evident in the quote above from the recent Defense Department report. The emphasis on sustaining military pressure through actions and tactics derives from America’s and its military’s propensity for tactics and action over strategy in the wars after 9/11. Since the Vietnam War, senior American civilian and military leaders have often neglected the key idea from Clausewitz, that in war military means cannot be divorced from political objectives and that the latter drive the former, guiding and communicating the logic of strategy to the grammar of violence. War’s purpose is to fulfill policy with the means of violence, not the other way around. Strikes and raids that kill or capture enemy leaders do disrupt Islamist militant groups like the Taliban, but their effects are impermanent, not decisive. Military actions can bring pressure and operational momentum they but do not amount to strategic momentum if they do not bridge the political object of the war and the violence with the logic of strategy. In the immediate aftermath of 11 September 2001, the horror and grief engendered by those attacks animated the collective will of the U.S. Government, its armed forces, and its people, in theory, to employ the means necessary to achieve the political end of punishing the al-Qaeda leadership, removing the Taliban regime that provided al-Qaeda with sanctuary, and preventing Afghanistan from becoming a sanctuary for al-Qaeda and similar ilk ever again. The problem was, however, that the American senior leadership after 9/11 emphasized the military action over political ends in Afghanistan, and so in the rush to respond to the attacks, the how and the what replaced the why and to what end. U.S. senior leaders did not fully analyze or appreciate how to align the violence they could undertake with policy objectives that aligned with a peace featuring a stable Afghanistan inhospitable to al-Qaeda and other like-minded terrorists. The Bush administration found the very idea of rebuilding Afghanistan (nation-building was a reviled term in the Rumsfeld Pentagon) abhorrent and instead targeted individual senior al-Qaeda leaders and terrorists for killing and capturing. For at least the first half-decade in Afghanistan, the U.S. depended too heavily on warlords, accommodated unscrupulous Afghan leaders, used air power indiscriminately, and killed too many non-combatants. All of this unjustly wronged many Afghans and catalyzed support among a number of Pashtun Afghans for the revival of the Taliban. To make things worse, Team Bush committed strategic malfeasance by choosing to invade Iraq out of ignorance and arrogance, only to create a quagmire. As a result, Afghanistan became a secondary and poorly resourced effort for the U.S., with a limited number of special operations and conventional forces conducting strikes and raids to kill or capture key leaders. There were too few troops and too little resources committed to address the challenges of stabilizing the country. During the middle of the last decade when the U.S. was mired in Iraq, security gaps developed in the east and south of Afghanistan. Pakistan filled those gaps with its two favorite Islamist surrogates, the Taliban and the Haqqanis. The U.S. leadership was then also unwilling or unable to either understand, or coerce or compel, the other real enemies who had directly or indirectly aided and abetted the Taliban regime and its al-Qaeda brethren in Afghanistan. Physical sanctuary, material, recruits, funds, and ideology flowed from Pakistan while funds and ideology from Saudi Arabia and other sponsors helped mobilize insurgents and terrorists in South Asia for decades. Pakistan continued to provide all of the above means of support to the Taliban and other militants after the Taliban fled to Pakistan in late 2001 and early 2002. The Obama administration tried to focus resources on Afghanistan with a measured and prudent approach to strategy. It undertook a laudable but insufficient effort to align means to the political object by crafting a theory of strategic victory for Afghanistan with the surge that began in 2009. But Pakistan’s malign yet predictable strategic conduct, coupled with an American inability to muster the creativity, resources and coercive measures to curb Pakistan’s pathological proclivities, accounted for the gap between the theory and the practice. After years of a limited number of troops conducting tactical strikes and raids, the Obama administration’s strategy and surge in troops made discernible operational gains but these were fleeting because the strategy failed to effect the sine qua non of the Taliban, Pakistan’s support and sanctuary. The sanctuary problem quoted above mainly explains the military impasse cited from the recent U.S. report. This is the second epic problem that has plagued and protracted the Afghan War. It stems from Pakistan’s long-ingrained strategic propensity for exporting Islamist militants as an instrument of policy. In other words, the stalemate is of Pakistan’s design. Pakistan has sustained the stalemate by its use of Islamist proxies in the form of the Taliban and the Haqqani Network, and imposed a strategic paradox on the Coalition because of an asymmetry of will and means. It has persistently used its means – a deep pool of zealous Islamist militants – to prevent the Taliban’s defeat, to protract the war, to erode the will of the West and its Afghan allies, and to make their means irrelevant. It has boiled down to an asymmetry in what the main actors, the U.S., the Afghan government, Pakistan and the Taliban, seek to achieve in Afghanistan, what value they ascribe to it, and what they will pay in time, costs, and sacrifices to achieve it. For the Taliban, it is existential and it is about their survival. For Afghanistan and its security forces it is likewise existential. In Pakistan’s case, it is about history, proximity, and perception, as Pakistan perceives its policy of asserting control and influence over Afghanistan as existential through the filters of its strategic culture. From its inception, Pakistan’s existential postulation was to oppose India and to revise the regional status quo through the export of Islamist militant proxies. This pathological tendency provided meaning and purpose for Pakistan’s political elites and its security establishment, and its civilian populace cohered behind it. Pakistan’s preference for Islamist terrorists is a strategic-cultural attribute. Six decades of experience in cultivating and using Islamist militants have deepened this propensity, where the export of jihad has become central to Pakistani strategy. But for the U.S., though a stable Afghanistan inhospitable to the likes of al-Qaeda is important as a measure to help prevent another 9/11, it is not vital or existential. For the U.S., the war is limited in purpose and means so the value of the political object it seeks is low relative to the Taliban and Pakistan. According to Clausewitz, the value of the object effects the costs and sacrifices a polity is willing to pay in magnitude and duration of a war. The value relates directly to political will and the costs of Afghanistan seem to have exceeded the value of the object for America. Conversely, for the Taliban and Pakistan, the value of the object is high and there is therefore an asymmetry of political will vis-à-vis the U.S. The Taliban are willing to pay the costs in magnitude and duration because the U.S. has lacked the will to impose higher costs on Pakistan. Therefore, even as Pakistan is supporting the peace talks, it sustains the Taliban as they continue to attack and bomb its targets in Afghanistan, like the devastating attack on the Afghan intelligence service’s base in Wardak last month. Since the beginning of this administration’s tenure in 2017, the executive branch has flipped and flopped in major ways a number of times. The president came into office wanting to get out of Afghanistan altogether. Then in August 2017, he heeded the advice of his most experienced and knowledgeable senior national security principals and announced a strategy with a commitment to a win in Afghanistan. The commitment was highlighted by the increase of about 3,500 U.S. forces – to a total of over 14,000 – to advise and assist the Afghan security forces. NATO countries also contributed additional troops, bringing the total number of Coalition troops in Afghanistan to more than 21,000. Beyond the strategic imperative to find a regional solution that would reduce external support for the Taliban, this approach re-aligned the increase in troops to advise more tactical units, to continue to double the Afghan special security forces and to expand the Afghan air force, all toward overmatching the Taliban in the fighting. This idea is that this increased capacity can build military pressure and operational momentum against the Taliban to convince them to reconcile with the Afghan government. Regional pressure would theoretically reduce the effects of sanctuary. However, at the end of 2018, the chief executive announced, apparently without consulting his Defense Secretary, that the U.S. would withdraw half of its 14,000 troops in Afghanistan. No orders yet exist for a withdrawal and no troops are yet withdrawing but if America does withdraw 7,000 troops this year it will be before the previously-announced conditions-based strategy have would time to be realized. Two corollary conditions are that the Afghan security forces are strong enough to deny Afghanistan as sanctuary for terrorists and that there is a political settlement with the Taliban, requiring the latter to have rejected the support or use of terrorism. These two conditions would be central to the aim of securing a stable South Asia that cannot be used to plan and support terrorist attacks against the U.S. homeland or its allies. The unpredictability engendered by Afghanistan, war, the peace talks, and the ill-advised announcement of a withdrawal all combine to promise much uncertainty still. The previously announced and stated political object from August 2017 through most of 2018 had been to win in Afghanistan. This offered some reason for optimism since it was a contrast to the previous policies, which seemed to be simply not to lose. Another reason for optimism from August 2017 through most of 2018 was that the strategy was based on conditions on the ground being met, not arbitrary timelines. The surge was tied to a rigid timeline that was not congruent with meeting the necessary conditions on the ground. The Coalition’s operational campaign and presence in Afghanistan have some advantages that can weigh on the peace talks, the negotiated agreement, and the potential peace. It is prudent to continue to strengthen the Afghan Special Security Forces, build the capacity of the Afghan Air Force, and improve the other security forces by continuing to sustain and employ the current number of advisers with tactical units that do the fighting until the negotiations see some serious results. The presence of advisors has a positive influence on the Afghan security forces and will provide more negotiating weight than hastily withdrawing half, or even one quarter, of the 14, 000 U.S. troops now helping sustain pressure on the Taliban. The operational approach should allow the Afghan security forces to win more battles against the Taliban and sustain operational momentum that will help sway key decisions and conditions during the future peace negotiations. A mutual and comprehensive ceasefire should be at least one precondition for any withdrawal of U.S. or Coalition troops because impulsive withdrawals translate to less leverage in the talks. A premature withdrawal would yield the necessary leverage to negotiate from a relative position of strength and it would signal a lack of will to verify and enforce any agreement. In addition, the Taliban and the Afghan security forces continue to wage war on the ground. The fighting on the ground is an instrument of the belligerents’ policies and the current level of Coalition force and advisors help sustain and improve the Afghan security forces capacity to generally outfight Taliban in heavily populated areas. Given that Afghanistan is the most permissive theater of war for the U.S. forces and the best platform for counter-terrorism efforts against the very Islamist groups that helped start the war, al-Qaeda and the Islamic State, retaining the platform and the capacity for the long-term should be on the table to guarantee that Afghanistan does not become a welcome sanctuary for al-Qaeda. But what would a real win look like in Afghanistan? A win would see a durable Afghan state, with the government, the security forces and the population aligned against a marginalized or reconciled Taliban. A policy to genuinely win would require a strategy that aligned U.S. and Coalition political will, intellectual capital, and capacity to defeat the enemy’s strategy. This means that for any strategy to have had held a chance of success, it should have focused on taking away the main sources of strength that allowed the Taliban to continue fighting for over 17 years. Pakistan’s sanctuary and support are the sources of strength without which the Taliban would not have survived until now. The modest increase in troops during the last year along with the strategy announced in August 2017 was not enough to break the strategic stalemate without any alteration in Pakistan’s strategic malice. Furthermore, reconciliation with the Taliban in Afghanistan will be a seemingly implausible goal if the withdrawal goes forward and the peace agreement does not demand or enforce verification and compliance. The principal goal of the South Asia Strategy restated in the December report is to end the war in Afghanistan on terms favorable to Afghanistan and the United States to achieve a durable and inclusive political settlement to the war. These stated aims seemed to have evolved into something more fungible than the talk of winning in the president’s speech of 21 August 2017 that announced his then new strategy. With the president’s unstaffed announcement late last year of withdrawing half the American forces from Afghanistan and with peace talks underway, the negotiated political settlement and its consequences will now possibly engender something less than unambiguous success. Until now the Taliban have adamantly and obdurately refused to talk to, reconcile with, or integrate with the existing government of Afghanistan. They view it as illegitimate and they did not want to join it but to take over because they see themselves as the legitimate Islamic government to institute and enforce sharia law. Until now they have also not renounced al-Qaeda or their collusion and support of other terrorists. The Haqqanis, an integral part of the Taliban, still remain on the U.S. State Department’s list of foreign terrorist organizations. And, importantly, the Taliban still want a complete withdrawal of U.S. and Coalition forces before they will commit to a ceasefire. For achieving peace, the current American approach and presence in Afghanistan would bring advantages on several fronts. The U.S.-led Coalition should retain this leverage to verify and enforce a peace. These are practical factors that argue in favor of sustaining the command and the force levels in both advisors and counterterrorism elements to ensure that Afghanistan does not fail. The existing Afghan government and its security forces do welcome and need the U.S. and its allies’ help to grow and improve. Though imperfect, the government and its security forces are working with the American-led Coalition toward common purposes of securing populated areas and bringing pressure to bear on the Taliban as well as denying sanctuary for other extremists. The long war in Afghanistan has entered its the fifth month of its eighteenth year this month. For war to end in success and a better peace, ends must drive means, not the other way around. The value of the political objective, or the worth of the ends sought, determines how long and what costs the U.S. should be willing to pay. The value of what the U.S. sought in Afghanistan related directly to America’s willingness to pay the costs in time and magnitude to prevail in war and bring about a successful outcome. The duration of the war and the magnitude of the sacrifices and costs now seem to have exceeded the value of the original political objective so the U.S. may settle for something less by suing for peace with the enemy undefeated on the battlefield. Now, the war in Afghanistan and the talks for ending will not be a win, but a qualified conclusion. One best case now for ending the war seems to be settling for a draw and a peace with some hope of enduring. A worst case would not be entirely dissimilar to the end of the Vietnam War where the delusion was peace with honor and a decent interval, yet the reality ended up being a peace with dishonor and an indecent interval between withdrawal and defeat. The North Vietnamese forces took Saigon just over two years after the conclusion of the Paris Peace Accords in January 1973. NB: This article does not reflect the views of any of the institutions with which the author is associated. Steve Coll, Directorate S. p. 536. New York, NY: Penguin Press, 2018. This quote was in his briefings to Congressional delegations that explained the single biggest obstacle to a successful outcome for the war in Afghanistan. S. Paul Kapur, Jihad as Grand Strategy, p.p. 32-50. New York, NY: Oxford University Press, 2017. Alex Marshall and Tim Bird. Afghanistan: How the West Lost its Way, p. 6. New Haven, CT: Yale University Press, 2011. Robert Cassidy, Ph.D., is a retired U.S. Army colonel. He is a teaching fellow at Wesleyan University and a senior fellow with the Center for Advanced Defense Studies. He has served in Afghanistan and Iraq.